The Music Education Series put together by this sabha is one, many academically interested music lovers and students want to attend. The lec-dem sessions are held between 8.30 and 9.30 a.m. throughout the festival days. This year's lec-dem series is sponsored by South Zone Cultural Centre, Thanjavur. 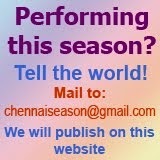 'Panchanadai Pallavi' by Chingleput Ranganathan, Principal, Teachers Training College, The Music Academy, Chennai. 'Technique of singing Varnam with Gati bheda by Trichy J. Venkataraman, Musician & Musicologist. 8.30 a.m. - A vision of Sri Rama in the compositions of Sri Tyagaraja by Prof. R.V. Krishnan, Retd. Vice Principal, Govt.Music College, Chennai. 10.00 a.m. - 'Isai Tarum Irumaappu' by Neyveli R. Santhanagopalan and Sri. Ganesh Sharma. 'Significant role of the anga-s in the Musical form Kriti' by Dr. Rajshri Ramakrishna, Lecturer, Dept. of Indian Music, Univ. of Madras. 'The Concept of 22 Srutis' by Dr. R.S. Jayalakshmi, Lecturer, T.T.C. The Music Academy, Chennai. 'Harikatha Chakravarthi Embar Sri Vijayaraghavachariyar' by Dr. B.M. Sundaram, Musicologist. 'A rational approach to vivadi svaras in ragas with proximity to Vadi, Samvadi & Anuvadi svaras' Dr. T. Sachi Devi, Retd Prof.of Music, Maharani Arts College, Bangalore. 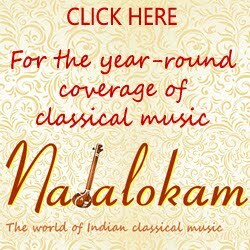 'Manodharma Made Easy' - Compositions as a guide to improvisation in both Carnatic and Hindustani music by Dr. Sriram Parasuram, Musician & Musicologist. 10.00 a.m. 'Sa Ga Ma Pa Ni Sa Patterns' `by Prof. S.R. Janakiraman, Musician & Musicologist. 'Viruttam Singing' by Aleppey Venkatesan, Musician & Musicologist. 'Venkatesa Vaibhavam' An ecstatic outpourings of composers (Prog : Dedicated to Sri. Embar) by Dr. M.Premeela Gurumurthy, Prof.& Head, Dept. of Indian Music, Univ. of Madras. 'Jatisvaram as a Dance form and as an Art form' by Dr. M.B. Vedavalli, Emeritus Professor, Dept. of Indian Music, Univ. of Madras. 'Mallaari and its Special Features' by Vyasarpadi G.Kothandaraman, nagaswaram, & Paalapattu Dr.R.Rajendran, Principal, Govt. Music College, Coimbatore. 'A critical study of Ramanatakam' by Dr. S.A.K. Durga, Emeritus Prof. Dept. of Indian Music, Univ. of Madras. 'Kolaru Padigam of Tirujnanasambandar - A study' by Smt. Vijayalakshmi Sankaranarayanan, Musician & Musicologist.